Relaxing and reflecting sound like a good idea to me. I think I'll wait this year in taking the decorations down. What's the rush? What wonderful ideas and thoughtful suggestions. I'm still in my robe! We have a high wind and freezing rain storm going on here in Central Illinois. My loved ones left yesterday and are safely in their warm homes so I am doing as you suggested. Yankee candles burning, lights on, and emptied totes under a mega leak in the attic! :D I love those little brown bags all dressed up. Did you do that? Stay cozy! Awe Debbie, I am right there with you, excellent post and a beautiful reminder for us all. I never take them down to soon. We went to my sister's later in the day on Christmas and her neighbor had already taken their tree down, it was lying in their front yard,I thought, how sad. Your gift bags filled with cookies were beautiful. Enjoy your fire and the beauty of the snow falling out your window today. You are absolutely right! I love the final week of the year. What a beautiful reminder that Christmas isn't over yet. I love the week between Christmas and New Year's for its calm, and for the time to visit with friends and family. Long ago, the season of Advent was one of waiting for Christmas, and included fasting and simple eating. I think we've reversed that and do our feasting and celebrating all before the 24th/25th instead of afterwards. On the schedule today is brunch with friends, and not much else! I did run the vacuum over the living room carpet today, picking up pine needles and other little bits. Yes, the 12 days of Christmas I've been raised to in the Old World. Here at our Episcopal Church we used to have an elderly couple that always invited friends over for a punch bowl with hors d'oeuvres after Christmas. Such a lovely tradition! Sending you hugs and blessings! Pieter is connecting our new Miele dishwasher that just got delivered by truck this morning. Finally a problem solved after a long wait. You are right Christmas isn't over yet, I have always thought it would be fun to celebrate the 12 days of Christmas, but never have. This year I am keeping my trees up at least through the New Year, maybe Three Kings Day too. We'll see. I like your crocheted angel, I have some just like it! Happy Monday to you and have a relaxing day! This is absolutely beautifully written - wow - you sure have an incredible talent for the written word, Deborah. I am so with you on every single thing you posted here today. We keep Christmas up until Epiphany, as it is supposed to be in "days of old." I sure wish we lived closer - I know we'd enjoy just being in one another's company, perhaps saying nothing and feeling closer than ever, ya know what I mean? Beautifully said, Deborah. Lovely words, lovely photos. 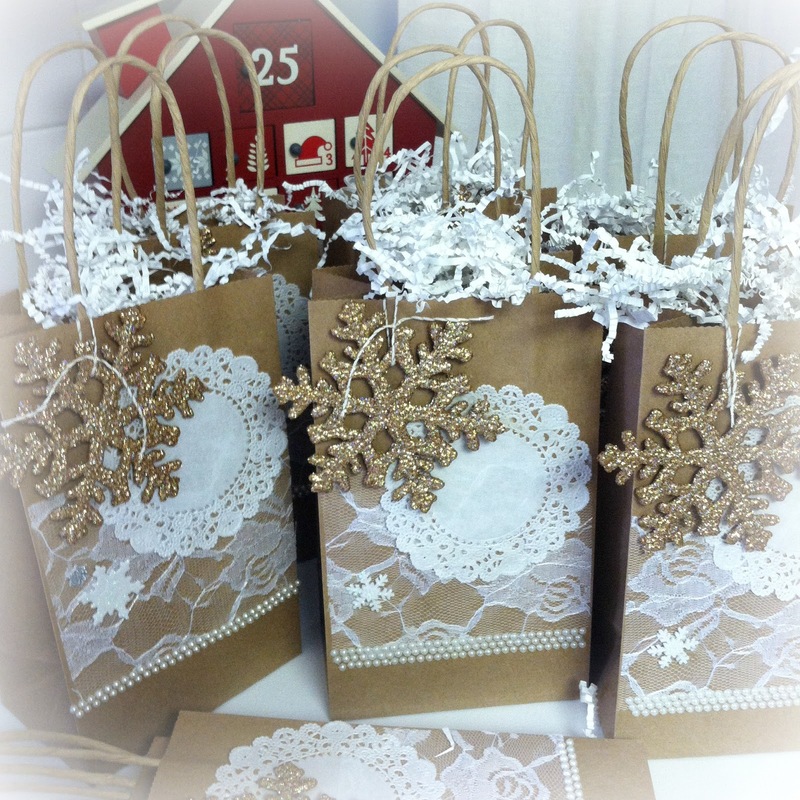 Your cookie gift bags are as much a treat as any cookies would be. So pretty. 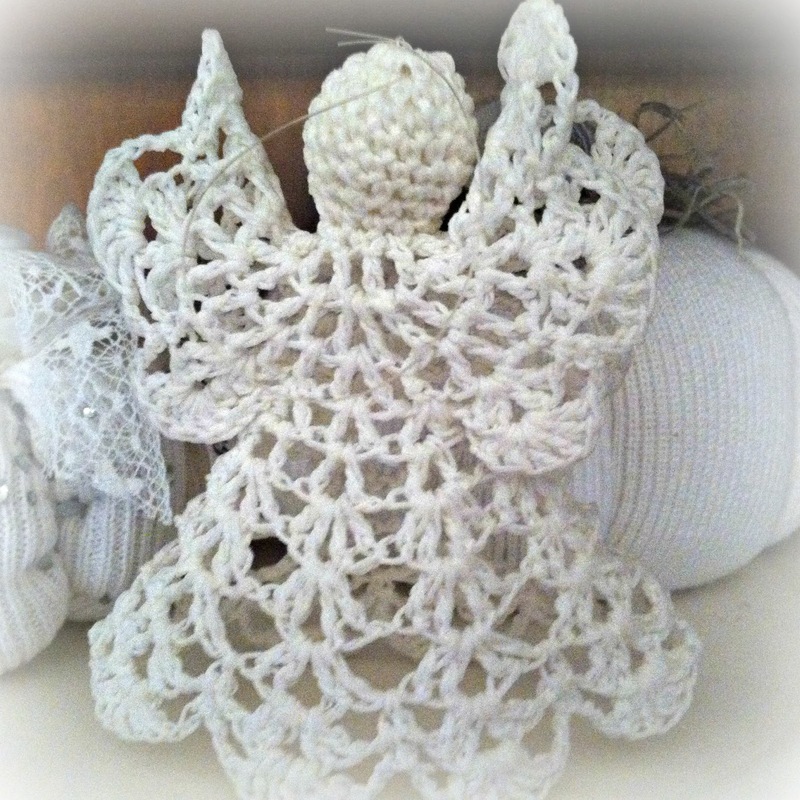 Your crocheted angel -- I have one just like her. Deborah, here's hoping the storm doesn't impact you too terribly bad, but that's certainly one way to sit back and just be cozy. I have spent today both sorting some old papers and putting a few things away (not the tree, keeping the twinkle a while longer), but in doing so, it was like revisiting with the memories attached to the things again (just like when they came out of their storage boxes in November). It's a bittersweet thing - comings and goings. Thanks for the gentle reminder to just enjoy the moments. Happy New Year. You made such pretty bags for your book group. I always wait until the 6th to take down the decorations. I am taking it easy too and enjoying the quiet after Christmas. Wishing you a Happy New Year. Well said, Deborah. I was fortunate to have 2 full weeks off from work so I'm trying to savor the last week of my holiday. I usually keep my Christmas decor up until the Epiphany. Happy New Year! You preach all you want to yourself, my friend, because I like to soak all your words and wisdom for myself. Enjoy that trea, your decorations, and the relaxing time by the fire. I know you miss your son, but this year holds so much promise for you. Happy New Year to you and your family! I couldn't agree more, this is how we do Christmas. We do not start before Thanksgiving. We carry on usually into January, sometimes well past Epiphany. Dark days and long nights cry out for the lights of the season to still be shining. Oh...I see I missed that last line about the storm. Although I hope it isn't too bad, I wouldn't mind having just a little bit of it...80 degree temps at Christmas just didn't feel quite right this time of year! :) Stay safe & warm! I love this time of year for reflection. It's hard not to feel like we should be doing something "productive" but I completely agree with you about a good, healthy reboot! YES !!! I have been tempted many times the last few days to take all the Christmas decorations down and pack them away, but then I thought the same thing you wrote, all the work to decorate , I AM going to enjoy this. Plus , I AM going to read my new magazine and spend time doing a few things I love to do but rarely take time for. Oh, and take naps. What better time for a nap than in the short days of a cold winter. A fire in the fireplace, hot tea, good reading and simple crafting. Thank-you for this small affirmation for me. Not one bit difficult for me to follow through on this right now. teehee And I so agree on those commercials. It seems every year everyone is a tad more in a hurry to push it all through. I couldn't believe how quickly the stores jumped from one holiday to the next. Could barely find Thanksgiving or fall items in the middle of November. SO exhausted after a year of wedding planning, and the entire event taking place on Dec 27. EEEEEKKK! I need a little more Christmas today. Thank you for stopping by, Deborah, and for your kind words. Thrilled to get back to visiting with dear blogging friends again. Happy New Year ...and many blessings to you.